I wasn't going to blog about what I am going through right now. It is a rough patch and I know that it will end and I don't want my blog to turn into some kind of wailing wall for an experience I signed up for quite willingly. But here I am and it is 9:30 am and I am exhausted from my days outing to find breakfast and leave my hotel for as long as I could manage. 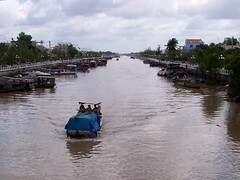 This is my first weekend in Tra Vinh and I am totally alone. Normally I am totally fine with being alone, and in some respects I still am now. I am happy to entertain myself by reading or studying Vietnamese or poking around on the internet. However, language barriers coupled with the fact that I am, I think, the only foreigner in this town of 70,000 people, makes being alone quite daunting. The language thing is not that big of an issue on it's own; I mostly know my numbers and I can point to things and say "thank you" to hopefully make up for all of the social graces I am ignorant of. But here I am a walking freakshow. I see people nudging their friends as I walk past so as to make sure they don't miss getting a look at me. It seems that Vietnamese culture does not consider it rude to point and laugh at someone. Also since Hien from WUSC left, people (men especially) have started calling/yelling at me in the street. Sometimes they say something in Vietnamese and sometimes it is just "hello". I am not sure if they are just being friendly or if they are trying to make fun of me or what. I have tried to few tactics to deal with the situation: ignoring, nodding, replying... the first two seem to have the result that the person just stares at me as I pass but the latter seems to makes people want to continue shouting "hello! hello! hello!" I am just not sure how to take it. I feel like a celebrity amoungst the paparazzi except without the money and fame! The only other non-Vietnamese faces I have seen have been on billboards. I am so jealous of those faces who can just watch and soak up this beautiful place with out worriying about doing the wrong thing and without having to be a walking spectacle. Originally uploaded by Pham Duy Anh. Tomorrow morning I leave my hotel to catch the 8:30 plane to Ho Chi Min city with Hien (WUSC logistics person) and then on to Tra Vinh. I am pretty excited about it, not that I don't like Hanoi, but because I am ready to settle in somewhere and actually start my work. I don't have a clear understanding of it, but this hotel has a longer-term residence also that I will check out. There was another housing option suggested for me, a newly renovated 2-bedroom house, but they wanted me to buy a fridge and stove and I am not really up for that. I hope that this hotel option will be good as it is affordable (2.5 million Dong or about 200 USD) and is close to where I will be working. I am looking forward to buying a bike in Tra Vinh too! I have felt so lazy in the heat of Hanoi. It is so nice to have today to just chill out and I have finally found somewhere with WiFi so that I can get my dose of CBC 3 podcast. I have really missed that! Having a bit of time to myself makes me feel a bit more normal again after the shock and stress of adjusting to a new environment. I have been hesitant to turn down any invitations from the other WUSC Canadians (Dave, Swee-Lin and Elaine) because I know I will very soon be yearning for some social contact! I have been quite spoiled by having these instant friends here in Hanoi who have shown me around and taken care of me quite a bit. We are all western Canadians with the other three coming from Alberta, so we have a similar vibe and sense of humour. The weekend Dave and Swee-Lin went to Ha Long Bay for a kayaking adventure and invited me along but I didn't think that I should spend so much moolah on touring when I will need to put up 3 months of rent and possibly some furnishings when I get to Tra Vinh. 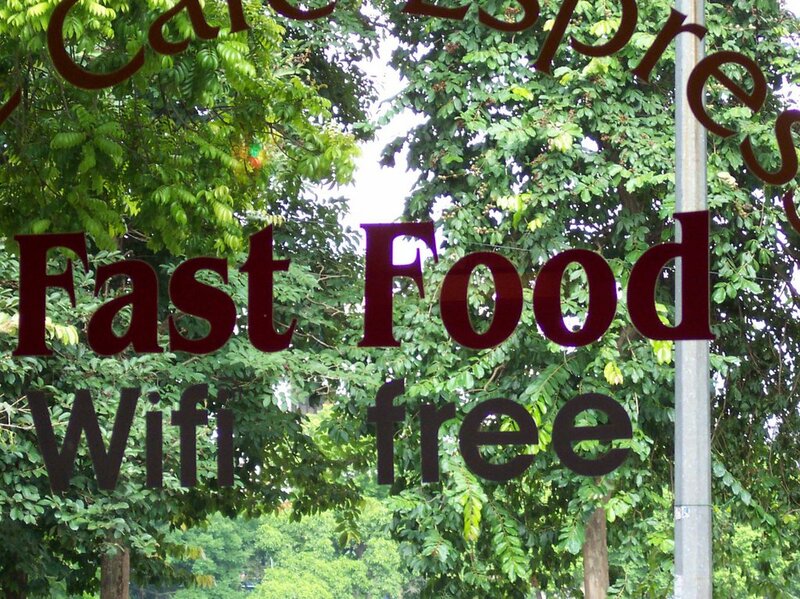 Yes, that means that I am still in Hanoi. The plan for leaving keeps getting changed and it is unclear what is going on, but I think that I will leave this coming week... maybe Thursday. Everyone keeps telling me that I will love it in the south, so I am really looking forward to going. Hanoi is a bit crazy with all of the traffic and disorganized bustle of life and I think living in a smaller town will be good for me. I am really going to need to get it together to learn some Vietnamese though as I have been spoiled in Hanoi where pretty much everyone speaks English. This week Jonathan booked a flight to come and visit me in January. I am glad to have this to look forward to during what rough moments surely lay ahead in a small Vietnamese town in the middle of nowhere. The director of WUSC was recently joking about me going "Apocalypse Now" in the Mekong jungle and I keep chuckling still about the thought of myself going AWOL and setting up some cult in the middle of the jungle. ee gad. Ten toi la Florine, Toi la nguoi Canada. This is about all of the Vietnamese I have learned so far, with the addition of "vang" (yes), "khong" (no) and "cam on" (thank you). This language is pretty tricky for several reasons. First and foremost, the 6 tones are hard to hear nevermind say, but also the alphabet is similar enough to European languages to give you a false sense of familiarity, when in fact the vowels and some consonants are pronounced quite differently (d is pronounced z for example). I have been working on my Vietnamese in part by watching quiz shows on TV where they say the question and then it is written on the screen, same thing with the answers. Who said that TV wasn't good for you! The other night I fully realized the extent of the difference between the northern and southern accents, though, when I saw a news program from HCMC that had subtitles so that the Hanoians would understand! The southern accent has a lot of "y" sounds... it kind of sounds like they are playing the audio track backwards! 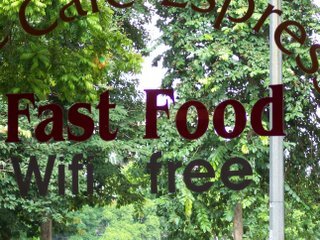 I hope that all my attempts to pick up a tiny bit of the language here in Hanoi will not be in vain when I am in the South! Speaking of which, I hope to be in Hanoi for one more week only, but were are waiting for official permission to go to the rural communities. Official permission is of the utmost importance in Vietnam, that much I have learned already. I have to apologize for a distinct lack of pictures here or on flickr. I have not taken many as I have just felt so overwhelmed by this city. Usually I take photos when I am struck by something, but so far I feel struck by everything! 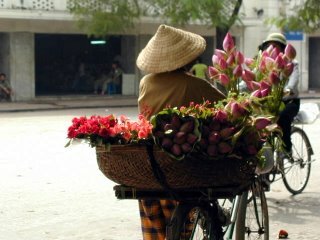 The one on this post I have stolen from the internet, but women in conical hats selling flowers are now a part of my daily sights. I will have to get some shots of the insane traffic to show you the kind of ingenuity people here have regarding transportation. The other day I say a guy transporting a large piece of hard plastic, probably 2m in length, by placing it on the seat of his motorcyle and then crouching on top of it, with the length jutting out the back and some how keeping his balance, not to mention operate the motorcycle! Even in a city like Hanoi, where there are a tonne of expats and tourists, it is still weird to be white in this city. I am very openly stared at everywhere I go, This morning I was strategizing about how to cross the street in crazy Hanoi traffic (all street rules are seen a suggestion only), when a middle-aged man on a motorcycle with two young girls somehow managed to negotiate his balance enough to actually point at me, laugh and say something as they slowly drove past. I hate to admit it, but things like this are starting to get on my nerves already. During this, the first full week of my internship I have really just been trying to get to know the city and understand the project that I will be working on. I think that the original idea that I would be conducting a research project on barriers and supports to education for minority girls seems like the priority really is to assist in an initiative that is supporting the development of PTAs in disadvantaged school districts. I will still be working in the Khmer community of in Tra Vinh, but more on the community development project than the research side. This is fine with me as I came expecting things to shift. There is some talk about me doing both, but I am not sure if that is realistic. I will certainly give it a shot. From what I have learned so far the education system in Vietnam is undergoing a huge shift from a teacher-centred approach where students learn by memorization, to more of a student-centred style like we have in Canada. It was hard for me even to appreciate what the difference between the two approaches were until I walked by a school and literally saw the teacher saying something and the students repeating it in unison. All learning in all subjects has been that way for decades in Vietnam. This coming school year will be the first of the new focus. The PEDC program has been established to bring children from minority communities, street children and other disadvantaged kids up to speed in the education system. The stats on basic primary education in Vietnam are very good, but as with many aboriginal communities in Canada, these children have been left behind. In some cases it really seems that a lack of physical infrastructure and funding is the problem, but this project proposes that parents and the community play a larger role in solving some of these problems in creative local ways. I will write more about this as I get a better understanding. I have been here less than 24 hours and I already feel doubtful about the fate of this computer I put so much effort into procuring. This morning I opened opened it to find that a colony of tiny bugs had found it a rather hospitable environment. Panic ensued as I shook, squished and cursed these aspiring Mac inhabitants into hiding, at least for the time being. I think I have probably just forced them deeper into the workings of the machine. If the heat and humidity doesn’t kill this thing, the bugs will do their best to seal the deal. I probably should not have brought it! Already it seems that is true of most of my wardrobe also as the claims that the Vietnamese dress more formally than we do in Canada does not seem to be true at all, at least not in the heat of Hanoi summer. I am sweltering my long sleeve button-up shirts! I have been in Vietnam for just over an hour and I am overwhelmed already. I have called home already. I have busted out pictures of home, I have put on Canadian music. I feel like I should be bursting to get out the door and explore the country that will be my home for the next 8 months, but instead I am camped out in my somewhat dingy hotel room. Part of the reason for this is the heat and my new but oh-so strong love for my fan. They say that it is 23 degrees, but it certainly feels like 35 in a sauna---- people use that expression in Canada “it’s like a sauna” but on the west coast it never ever truly resembles the steam room like Hanoi in July does. Dave, the other WUSC volunteer, just called and he and his partner have invited me for dinner. This is good, as I might otherwise have hid in my hotel room all night living on whatever I can find in the mini-bar until I was picked up tomorrow morning. I should mention that I will wear two hats in this Vietnam experience; WUSC volunteer and CAPI intern. Both agencies refer to me in their own lingo and both expect that I do the same. Over all I think there are more benefits than drawbacks to the dual arrangement. The flight from Vancouver to Narita was quite uneventful. I had a window seat so I could rest my head and actually sleep unlike my flight to Spain. I watched "V For Vendetta" and it was good... not much else happened. The Customs officer looked about 16 years old and was certainly more intimidated of me than I was of him. I brought what felt like a mountain of possibly suspect baggage and all he asked me was "Is this your first time in Japan?". Before waving me through. I didn't get any yen and this was a very bad idea, as I was very limited in my activities in Narita for that reason. On my return I will go the same way and won't make the same mistake. But I keep telling myself that nerves and worries are normal and I am doing my best to cope. I am a bit of a wreck as I contemplate my journey tomorrow. 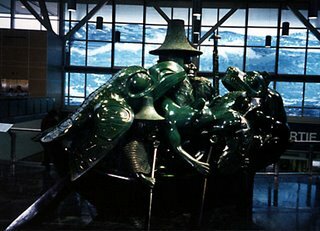 At least I can look forward to being sent off in style by all of the beautiful First Nations art at the airport. I have spent most of today trying to configure the wireless for my new (to me) ibook. For those Mac people out there, you may be aware how impossible it is to get an old airport card, so I bought this router that can act as a wireless card, in addition to its other capabilities. Anyway, trying to make non-apple hardware work on an old mac can be quite torturous and it has stolen my day from me. I am writing on it now, so I hope that the worst is past me. Poor Jonathan has been quite neglected. Last night I said good bye to most of my Vancouver people at the Kino cafe's Flamenco show. It went well, but noone knew eachother, so it was a little subdued. Nonetheless, I had a great time and I feel much more solid in heading off into the unknown knowing that I am so supported by both my Victoria and Vancouver people. I resolve to have more parties when I am back in Canada so all of you great people can get to know eachother better! Think of me at three tomorrow and I will write from my stop over in Tokyo if I can.